Atomic spectroscopy is a widely used technique with diverse applications. Based on the interactions of light and matter, spectroscopy is often used to identify substances by the wavelengths of light they absorb or emit. Conventional systems have many large components, whereas the compact, fully planar device developed at UCSC enables the study of atoms and molecules on a chip-based platform with integrated optics, said Holger Schmidt, associate professor of electrical engineering. 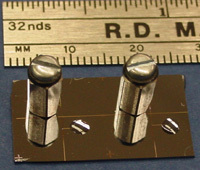 The key to the group's achievement is their development of hollow-core optical waveguides based on antiresonant reflecting optical waveguide (ARROW) principles. In previous publications, Schmidt and his collaborators have described other uses of ARROW waveguides integrated into chips using standard silicon fabrication technology (see earlier press release). Note to reporters: You may contact Schmidt at (831) 459-1482 or hschmidt@soe.ucsc.edu.